Z Blok sunscreen is the best sun protection for your face! Z Blok sunscreen solves the annoying and sometimes even dangerous problem of burning or stinging eyes caused by sweat or water mixing with your sunscreen. You can put Z Block sunscreen all over your face, including your eyes and not have it sting or burn your eyes and it is fragrance free. Plus you get broad-spectrum protection from both UVA and UVB rays with zinc oxide, which helps to prevent skin cancer and premature skin aging. 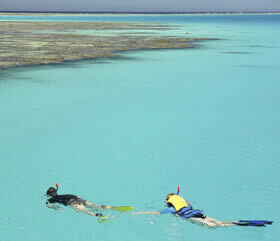 I am so glad I came across Z Blok prior to our trip to the Great Barrier Reef. It stayed on for hours and did not sting our eyes when in contact with saltwater or sweat. Fantastic! My father and daughter applied it before an entire morning of kayaking and snorkeling in the harsh Australian sun and it protected them all day without reapplication. The whole family really loved it. The lip balm is really good too. Many sunscreens for lips taste terrible but not Z Blok. Thank you for making a high quality sunscreen with zinc oxide. Z Blok was the only sunscreen I used for our recent 22 day hike and climb of Mera Peak in the Nepalese Himalaya. From sea level to the 21,000 ft summit it was 100% effective in preventing sunburn and skin damage. The non greasy formula was perfect for use on an expedition where the first shower was on day 18! I'll never sail or climb without Z Blok in future. Being a PGA teaching professional for 30 plus years in the south Florida sun and being fair skinned, a quality sunlock is a very important tool of my trade. With Z Blok i feel protected all day. And when sweating in the hot Florida sun it's great not to worry about sunblock getting in my eyes and having them burn all day! Great product!! I recommend it highly!! I spent the last month at our marina in Belize and received great feedback on Z Blok. So we're pulling all other sunscreens and will only be selling the Z Blok. We're coming up with a plan to expand the distribution within the area. They're so conscious of protecting the environment and I feel your product would be exactly what the tourists want. I am sending a photo of what chemotherapy looks like. 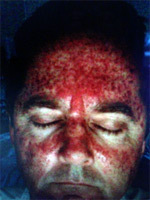 I had to do a round of topical chemo (flourcil, also can be delivered via IV) for skin cancer caused from sun damage. As I said in my previous email to you I never wore sunscreen because I never found one that didn't burn my eyes or make me feel like I was wrapped in a plastic coating; that was until I was lucky enough to find your Z Blok. I wear it daily with no burning eyes and it leaves my skin feeling natural. Feel free to use the photo as a warning to others on your website the chemo made me so sick it was just awful. 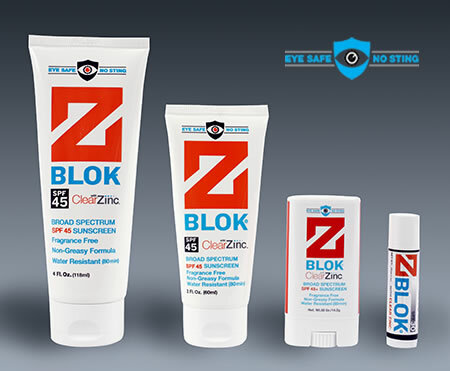 Z Blok is the best sunblock on the market. We use it on the 49er exclusively. It lasts all day in whatever conditions we are in, which can often be very wet. We spent 6 weeks in Australia last fall, and came home without as much as a tan. It is key for us to be able to apply at the beginning of the day and know that application will last. The no-sting formula allows us to keep focused on what really matters. On PUMA'S il mostro, we have been running a brand new sunblock called Z Blok. The company had been doing research for 10 years. They came to me with an idea: If they could eliminate eye stinging from sunblock and upgrade the UV protection as well as do it odor free, would we be interested in trying it out? I thought, can the stuff also drive fast in a big breeze? So we tried it on Rambler last year in the Buenos Aires to Rio race and low and behold the stuff did what they said it would. It is key for boats like this to have the non stinging part because we are almost always wet on deck. The UV protection is nothing short of fantastic. And we don't smell like perfume. All good. So thank you Z Blok. You have certainly made our lives a lot more bearable as we cross the equator 4 times in this race. Pretty psyched we made this choice for such a key item. I 've been smearing Z Blok on my mug for over two years now in a variety of conditions and I have to say it's the best sunblock I've ever used. Whether I was surfing the North Island of New Zealand, climbing Aconcagua in Argentina, kayaking around the four northern Channel Islands or exploring the Colorado Desert, I swear by the stuff. Last winter I didn't get sunburned once at Rincon with sessions sometimes lasting five hours. On long trail runs sweat didn¹t wash it off, nor did it sting my eyes. My name is Skyler Palmer. I just completed the 2010 Vic-Maui sailboat race from Victoria BC to Hawaii. I was aboard the boat Terremoto. Myself and the other three crew were very impressed by the performance of your product offshore. We were out for eleven days and when we got to shore there were multiple comments that we didn't even get tan. This is the first summertime offshore trip where I haven't seen a single sun burn. When I am fishing I am usually in an area near the equator where the sun is toughest on your skin and the weather is very warm. I like the fact that there is no sting when I perspire and no paba burn on my skin... it is good stuff. I didn't originally connect the Z in the name with Zinc, but I have always heard that Zinc and Zinc Oxide are among the very best sun protection ingredients. I have had a lot of basil cell issues in the last 20 years and I am always looking for the best products...glad I found Z Block. burning eyes for hours after playing tennis on hot, high sweat days. Z Blok is much better in that regard. Thank you for the customer service. I recently tested Z Blok on an all day fishing trip. It was quite warm that day and even though I broke a sweat it did not burn my eyes as advertised. My arms had to reach into the water several times to release fish and the Z Blok did not wash off as many lesser sunscreens would tend to do. Overall a great product for the outdoorsman who will work up a sweat and still wants a good sunscreen that blocks UVA and UVB. On August 22nd, my team completed the Eco Primal Quest, a 600-mile adventure race that took place in the very sunny South Dakota. Known as the ‘World’s Toughest Human Endurance Race”, our team were delighted to finish the race in 9th position among the world’s elite. After near race ending sun burn in our last ‘heat’ race, this year we made every effort to prevent another occurrence, which is how we came across ZBlok. Thankfully, our efforts paid off and ZBlok lived up to its promise and protected our team along every mile of the race. Along with the obvious importance of being protected from both UVA and UVB rays, one of the huge benefits we found was that despite the amount of sweat, never once did we experience that eye closing, stinging sensation when sunscreen gets in your eyes. I can’t tell you how important this is when you are racing down the side of a technical downhill on your bike, or whipping down a white-water river!!! ZBlok proved itself mile after mile and has made its way on to our ‘must have’ gear list. Great product. I used it on a 4 day boat delivery from St. Pete to New Orleans. Then it made the 2009 Jazz Fest for two weekends. It does exactly what you advertise. Because it does not irritate my eyes, I put it on any time I am out in the sun. After paying the price for years in the sun as a kid, when no one knew What the sun could do to you, this product will be with me at all times. I am a sailor who enjoys the sun year round if possible. Due to years of sun exposure, I am prone to Sun poisoning. This year, on my vacation to St. John, I used Z-Blok for the first time. I was skeptical at first, but to my delight I did not have one issue with sunburn or sun poisoning! I am now a convert - the only sunblock I will use is Z-Blok!